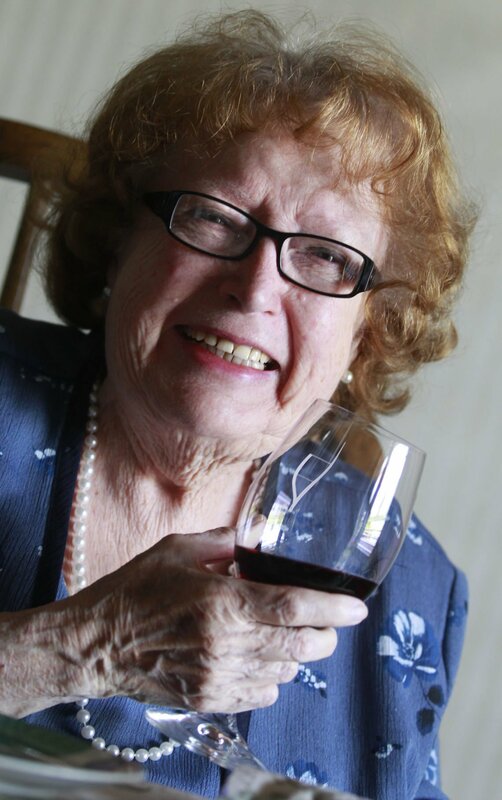 Ann Cierley, retired West High principal, became well-known in local wine circles as a wine educator and enthusiast. Bakersfield native Ann Cierley enjoyed a rich, successful, and sometimes feisty career in education and upon retirement poured herself into the world of wine, as a hobbyist, educator and expert. Cierley died Wednesday after a long illness. She was 87. In this photo taken last summer, Ann Cierley sits beneath a photo of her, which hangs in the wine room at Imbibe Wine & Spirits. Cierley, a retired career educator and principal of West High School, is credited with helping create and nurture a growing wine culture in Bakersfield. She died Wednesday, two days before her 88th birthday. Ann Cierley served as principal at West High School from 1981 to 1992. Ann Cierley, believed to be from her graduation from UCLA in 1952. She was the kind of person who liked to see others do well. As a teacher at Burroughs High School in Ridgecrest, and a teacher and principal at West High in Bakersfield, she did much to steer her students toward exactly that end. And later, as a wine lover, she remained throughout, an educator. Ann Cierley, who enjoyed a rich, successful career in education, and upon retirement poured herself into the world of wine as a hobbyist, wine educator and ambassador, died Wednesday, two days short of her birthday. She was 87. "Ann was the queen, one of the original people who started the wine scene in Bakersfield," said Bernie LeBeau, a local attorney and friend who would often meet Cierley and other wine lovers on Friday evenings in the tasting room at Imbibe Wine & Spirits. "Wine is for sharing, not for drinking alone," LeBeau said. "And Ann epitomized this idea. Nothing made her happier than finding a special bottle of wine and tasting it with friends." Indeed, her presence in local wine circles was such that several months ago a photo of her was placed on the wall at Imbibe, overlooking the table where her group gathered. "She lit up the first time she saw it," said David Dobbs, the owner of Imbibe. Cierley was exploring, tasting and learning about wine "back in the '60s before it was fashionable," Dobbs said. "She knew many of the winemakers. She was way ahead of the rest of us." Born in 1931, Cierley graduated from Bakersfield High in 1948. NFL legend and sportscaster Frank Gifford was on her sports staff when she was editor of the student newspaper, the Blue & White. After graduating from UCLA in 1952, Cierley did her student teaching in the Los Angeles area before returning to Kern County and signing on to teach at Burroughs High in Ridgecrest, adjacent to China Lake Naval Weapons Center. Many of her students were the children of the civilian scientists and administrators working at China Lake — and they excelled. For many years she remained in touch with former students who went on to successful careers in a variety of disciplines. There was no debate team when Cierley arrived. So she built one. "Ann started the debate team," recalled her sister, Shirley Monroe, of Santa Barbara. And it, too, excelled. Cierley never had children, but in a way she had hundreds. "Her students were her children," her sister said. In 1975, Cierley moved back to Bakersfield and went to work at West High. Its academic programs were quickly among the city's best, its students among the most gifted. Its extracurriculars dominated; not only were its sports teams strong, its Academic Decathlon and speech-and-debate teams were almost untouchable; at one point the Vikings' AcaDec teams won 10 consecutive and 16 out of 20 Kern County championships (1980-89, 1992, 1995-99). Its 1982 speech-and-debate team won the state title. Not that Cierley deserved all the credit. At the time, the school had students from some of the most most well-off neighborhoods in town. Nevertheless, some have called her the John Wooden of high school academic competitions, as her teams rarely lost. As West's principal from 1981 until 1992, in a sense they were all performing under her watchful eye. One of Cierley's favorite stories involved Rep. Jim Wright, who served as the 48th Speaker of the U.S. House of Representatives from 1987 to 1989. Wright represented Texas's 12th congressional district from 1955 to 1989. And he was Cierley's second cousin. "She was one of Jim Wright's favorites," Cierley's sister recalled. "He would come to visit and his detail would wait outside while they talked." After retirement, Cierley went full-bore into her wine hobby by making it more than a hobby. She wrote occasional pieces published in The Californian, and for a time wrote a wine column for the newspaper's little sister publication, The Voice. And for years she managed and was the wine buyer for Stars Theatre Restaurant in downtown Bakersfield. She's going to be missed, her friends said. By former students, former colleagues and myriad wine friends, from Bakersfield to Paso Robles to Napa and beyond. "She was a pretty liberal Democrat. I was a conservative Republican. But that didn't matter," LeBeau said. "You couldn't help but like her."